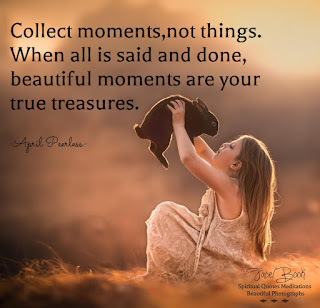 Every life is filled with treasures. and forfeit joy only they can give. and should be prized above all else. BE THANKFUL AND REJOICE IN IT..
of home, health, love, hope, peace. and make life more beautiful. The magnificence of creation is a treasure. the music of birds, the change of seasons. Truly there is an abundance of treasures. at a later time and place. after we have achieved some important goal in life. These beliefs are not true. YOUR TREASURES ARE WITH YOU NOW. You can enjoy them now. as only things that money can buy. like treasures of the heart. Mankind's basic needs for happiness has never changed. is to have the greatest wealth imaginable. but in the things you hold dear today. These are the true treasures of your life. Want to be happier and enjoy life more?